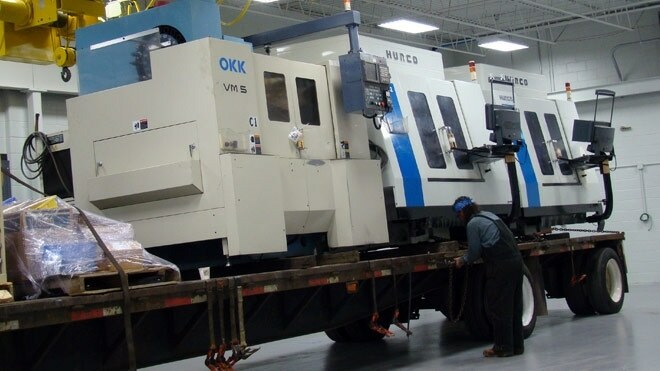 CNC Settles Into Second Facility | KLH Industries Inc. There's a familiar hum of spindle motors at KLH Industries. A pleasing ping of metal chips as they spatter into the scrap bin and a sharp smell of coolant mist inside the machines. There's just no mistaking the sounds and smells of CNC machining. As some customers may know, KLH purchased a second facility in 2011, increasing the CNC department's usable area by over 180%. This past month, KLH begun using that floor space, as seen in this time-lapse video of moving day. Thanks to some prudent planning, the CNC machining centers were loaded on a Friday and making chips by the following Monday. Some machines were back online by Friday night, much to the delight of the machine operators. "I'm still getting used to things in the new building," says one CNC machinist. "Everyday for years my caliper has been in the same spot, but now things are just a little different. You take that for granted, but I guess that stuff is just growing pains." While the company was physically growing, there was no scheduled outlook for additional capacity or workforce. KLH bought a second building to facilitate, literally in this case, future opportunities for growth. As it turns out, that growth opportunity would be shortly after moving day. Eighteen days. It took 18 days for a chunk of that additional manufacturing floor to become additional manufacturing capacity. In the next week or two, KLH will be adding a Doosan DNM 500 to the lineup. A 4-axis vertical CNC milling machine, the DNM 500 features a 12,000 RPM spindle, meaning better surface finish and smaller tooling for those hard to machine dimensions. The DNM 500 isn't the only new Doosan machine scheduled for the delivery in the upcoming months. Keep reading the KLH newsletter for more updates on some new capabilities and increased capacity. "Capacity is a bad bottleneck to have," admits CNC Business Unit Manager Steve Cruz. "At first it was floor capacity, then it was machining capacity, but now, we're ready for more."